Is there a zucchini hater in your family? Give this Skinny Zucchini Casserole a try and see how it disappears fast. This is one of our favorite summer side dishes or a light summer lunch. 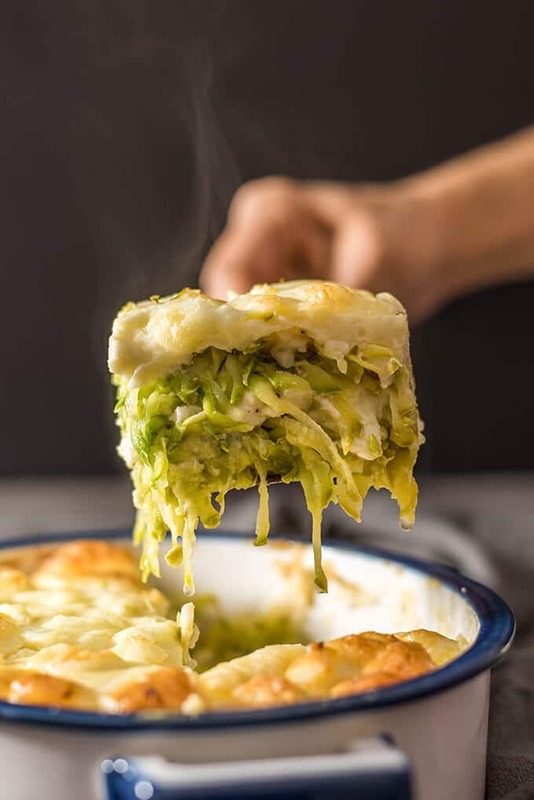 Shredded zucchini baked in oven with layers of mozzarella and a mixture made with an egg, yogurt and flour. This post was originally published in 2015 and we are updating it today with additional information. This is the Best Skinny Zucchini Casserole that will make you forget about all other zucchini casserole recipes. Do you hate zucchini? You’ll have to change your mind after trying this super yummy casserole. You will be surprised by the simplicity of the recipe and the very tasty result. You won’t believe this is one of the low calorie casseroles. It is so GOOD that you don’t need to be on diet to make it. Believe it or not, you don’t need lots of butter or heavy cream to make a tasty zucchini recipe. Skinny can be tasty too! I promise. If you are following Give Recipe for a while, you might have realized that we’ve shared LOTS of zucchini recipes this summer since we began this blog. Zucchinis are abundant in summer and I’m always trying to develop new recipes with this super healthy vegetable. Hope you aren’t bored. Maybe I can prepare a cook book about the best zucchini recipes one day. What do you think? I just want to make everyone see that they will love zucchini as long as they combine it with the right ingredients in the right way. If you are a zucchini lover though, just write ‘zucchini’ in the search box on the sidebar and find our 30+ zucchini recipes. Ok you can start with our readers’s all time favorite Chocolate and Yogurt Zucchini Bread if you are a chocolate lover and not after a low calorie recipe. We already have a skinny zucchini casserole recipe on the blog, which is LOVED by our readers. It has become the most favorite recipe of us since the first day we published it. I wanted to try a skinnier version this time and to be honest I love this one even more because of my love of yogurt. 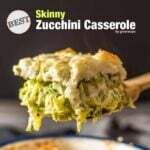 What makes it the best skinny zucchini casserole recipe? Unlike our former casserole, this baked zucchini casserole doesn’t have a golden crust on the top. I didn’t use any breadcrumbs or cornmeal for topping this time. I just prepared a simple mixture of plain yogurt, flour and egg and layered shredded zucchini in a baking pan with it. In addition, I used 2 eggs in the former casserole and it was ok, but I wanted to try this one with 1 egg. I didn’t mix it with grated zucchini, I added it in the yogurt mixture. I wasn’t sure at the beginning whether it would be enough to hold the ingredients together as I wanted to serve it in squares. It was pretty enough as you can see in the pictures. As for the amount of flour, I added just 2 tablespoons. I used all-purpose flour, but you can use flour of your choice. If you are following a gluten-free diet, you can use rice flour or corn meal or any other gluten-free flour on hand. Yogurt will do the work, so it doesn’t matter. You can also check out our list of 15 Gluten Free Zucchini Recipes post if you’d like to see more options. Oh and for those who are into baking, Michelle of My Gluten Free Kitchen prepared a great list of 30+ Gluten-Free Recipes For Baking With Zucchini. I’m sure there is something for you, go visit it! Another thing that makes this zucchini casserole recipe skinny is that it doesn’t have any butter or oil. Just very little to grease the casserole pan. Trust me you won’t miss butter or oil at all. On the other hand, black pepper is a must for me when making a casserole with zucchini. And it doesn’t have anything to do with calories, right? Use generous amount of it. There is something I need to warn you about the recipe. You should squeeze the grated zucchini very well. To make this, sprinkle a pinch of salt over grated zucchini, wait for 5 minutes to let it release excessive water and then squeeze in your hands. Otherwise, you end up with a watery or soggy casserole. So make a layer of grated zucchini, top with shredded mozzarella and yogurt mixture. Make another layer of zucchini and yogurt mixture. Bake it covered for 35 minutes, uncover and top with extra mozzarella. Bake for another 15-20 minutes or until golden. 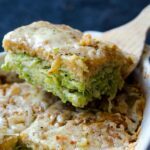 The mozzarella and yogurt layers inside and on the top make it my best skinny zucchini casserole. SKINNIEST yet YUMMIEST zucchini recipe. Forget all the zucchini recipes you know! Mix yogurt, egg and flour until you have a smooth mixture. Sprinkle salt and black pepper on zucchini and mix with your hands so that it is coated evenly. Grease the baking pan. Place 1/2 of the grated zucchini. Top it with 1/2 of mozzarella and 1/4 of the yogurt sauce. Layer with the other half of zucchini. Top with the rest of the yogurt sauce and cover with aluminium foil. Bake it for 35 min. Uncover and add the rest of the mozzarella and bake for another 15-20 minutes or until golden. You should squeeze the grated zucchini very well. To make this, sprinkle a pinch of salt over grated zucchini, wait for 5 minutes to let it release excessive water and then squeeze in your hands. Otherwise, you end up with a watery or soggy casserole. I added cooked chicken and Italian seasoning. Also, I had pepper jack and cheddar but no mozzarella cheese, and still delicious! 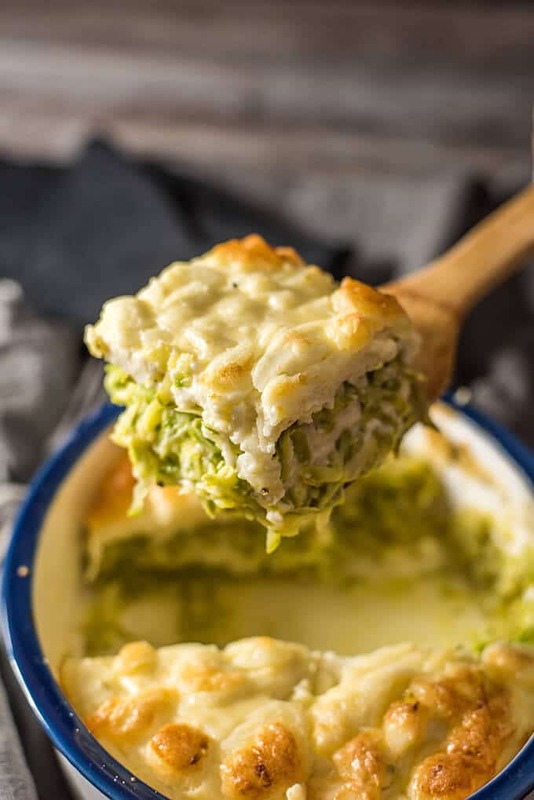 This casserole is truly the best for zucchini fanatics 😍 you did rock the zucchini, Zerrin! Thank you Natalie! Zucchini is at its best in this recipe. Hope you have a chance to try it. Good besides the pepper overboard! I would probably do about 1/2 tsp. Hi Amanda! I’m sooo happy to hear that! Enjoy the late summer zucchini! I made this last night and it’s a new favorite! So much yum. Thanks for sharing it. I can’t wait to make it again. Hi Lynn! I’m so happy to hear that you loved it! One of our favorite summer dishes. It’s incredibly tasty, isn’t it? This was SUPER delicious! The bomb! Using my new food processor I started with the wrong blade and had two mushed zucchini…changed the blade and added two more with the right consistency. Squeezed the devil out of the salted zucchini and the dish came out perfect in spite of my mistake. That topping was lovely…so delicate. I added a bit of parmesan to give it a little bite. Can’t wait to make it again! I like the idea of adding chard and similar items on hand. Thanks so much! Hi Nancy! Glad to hear that you love the recipe! We’ve made it several times this summer as well. I’m planning to try this with ground beef and if we love it as much as this one, I’ll share it on the blog too. Cheers! I can’t figure out if this has been on my “to-do list” for 1 year or 2. No matter. I made it and it was delicious. It also used up the most zucchini of all my saved recipes. (stirred in a clove of grated garlic, some chopped chard, and some herbs. Oh, and some feta.) It’s a keeper! Have you or anyone else ever made this with spaghetti squash? I cooked a spaghetti squash and want something different to do with it. I made the zucchini version and oh my, it was absolutely delicious. I ate the whole thing in 2 meals. Yum. Hi Karen! Glad you loved this recipe. We don’t have spaghetti squash here in Turkey so I haven’t had any experience with it. I’d love to hear the result here if you try the recipe with the spaghetti squash. IT might give an idea to others too. Cheers! This sounds great and I am definitely going to try it! Would like to know what size the casserole dish was? Was thinking I could double the recipe and use a 9×12 size? Also, did you use regular yogurt or greek style? Hi Nancy, you can definitely double the recipe and a 9×12 is just fine. I used regular plain yogurt. Enjoy! I just bought a ton of zucchini at my local farmers market here in Bangkok (it’s not always easy to find here, so I buy a lot when I do) and now I’m looking for new zucchini recipes to try 🙂 Will definitely give this one a go. It looks easy and is not loaded down with fat like so many of the other zucchini recipes I’ve discovered. Thanks. This recipe sounds lovely. I am also in a zucchini frenzy lately. I have 4 large ones in the celler, so I am cooking something with zucchini every other day. Last week I made your baked zucchini with cheese. They were great.